This easy potato soup recipe is perfect for when the weather forecaster is predicting a hefty snowstorm coming your way. You figure, ‘how bad can it be?’, and decide not to give into the panic shopping that takes place across the region. The following morning you awake, let the dog out and after wrestling with the back door, you see snow and lots of it. The day goes on, the kids are inside after blissfully sledding, having snowball fights and making snowmen. Suddenly you realize it’s nearing dinner! No worries, here’s a hearty, easy potato soup recipe that requires ingredients we all have in our pantry. Potato soup originated in Peru, where potatoes were plentiful, around 7,000 years ago. They were brought to Britain by explorer Sir Walter Raleigh in 1589. Shortly after that, a royal banquet was held to showcase potatoes and how they could be used in different types of foods. The cooks were new to using potatoes and threw the potatoes away using only the leaves and stems to make potato soup. Because these elements are poisonous, everyone who ate the soup ended up getting food poisoning. However, as years went on, cooks found their stride and several potato soup recipes were developed. A basic recipe can be made by adding vegetables like broccoli, peppers and carrots. Butter, cream, onions or leaks are often added as well. In Ireland, potatoes are mixed with butter, milk and scallions. Cabbage is added to enhance the flavor. Other cultures include spices like thyme, rosemary and cilantro to give their soup a unique flavor. Some make a sweeter version with sweet potatoes, cinnamon, nutmeg and brown sugar. Our recipe is pretty basic. 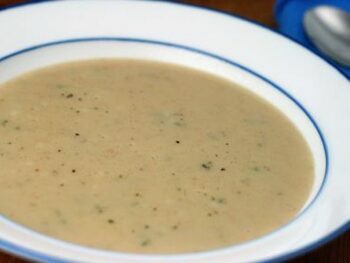 We use just potatoes, milk, butter, onion and flour to give our soup a great taste and texture. Salt and pepper are added as well. 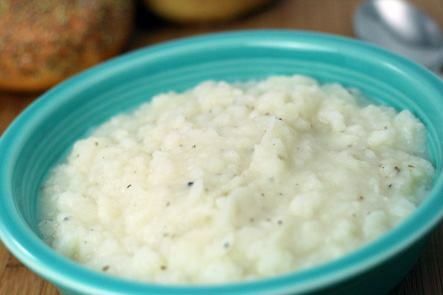 Although the recipe is basic, it’s a great starting point for chefs who want to make their own unique versions. 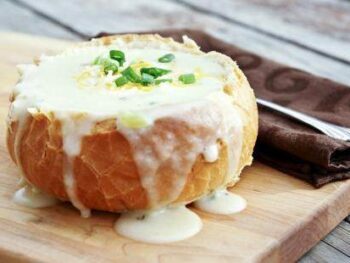 What will you be adding to your potato soup on your next snowy day? 1. 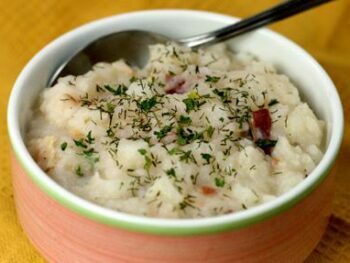 Cut potatoes into small pieces and cook in salted water, with the onion. 2. In a heavy pan melt the butter over low heat. Stir in flour and cook until bubbly. 3. Slowly add half of the milk. Add hot, cooked potatoes and onion mixture. 4. Use a potato masher to break up potatoes a bit. Add the rest of the milk and the salt and pepper. 5. Cook over medium heat until hot. If it is not thick enough, shake 1 tablespoon of flour with 1/2 cup cold milk and add to the soup, stir frequently, garnish with a sprinkle of dried parsley.